Vicky Giouroukakis, PhD, is a professor in the Division of Education at Molloy College, Rockville Centre, New York. She teaches undergraduate and graduate courses in literacy, English education, and TESOL. Prior to her tenure at Molloy, Giouroukakis taught English at a public high school in Queens, New York, and ESL to adolescents and adults. Giouroukakis is the coauthor of the Corwin best-seller Getting to the Core of English Language Arts, Grades 6–12: How to Meet the Common Core State Standards with Lessons from the Classroom and Getting to the Core of Literacy for History/ Social Studies, Science, and Technical Subjects, Grades 6–12. Her research and publications center on the topics of adolescent literacy, teacher education, cultural/linguistic diversity, and standards and assessment. She has been interested in standards and assessment and how they affect instructional practice ever since she began teaching. Giouroukakis' work has been featured in books and scholarly journals, and she frequently presents at regional, national, and international conferences. She also serves as a consultant for the Boards of Cooperative Education Services (BOCES) and provides professional development to various school districts. She received the Educator of Excellence Award from the New York State English Council in 2010 and the Research Achievement Award from Molloy College in 2015. This not a test-prep book. 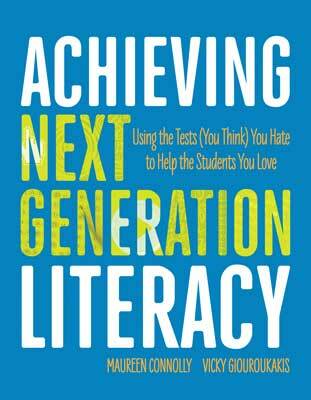 It is not about "drill and kill" practices that narrow learning so that students will pass an exam. Instead, authors Maureen Connolly and Vicky Giouroukakis present a lesson planning approach for the secondary classroom that generates test success as a byproduct of comprehensive literacy learning.